498 pages | 79 B/W Illus. Identifying athletic talent and developing that talent to its full potential is a central concern in sport. Understanding talent identification and its implications for both positive and negative developmental outcomes is crucial to sporting success. This is the first comprehensive resource for scientists, researchers, students, coaches, analysts and policymakers looking to improve their knowledge of the talent identification and development process. With contributions from leading researchers and practitioners, this book offers a complete overview of contemporary talent identification and development from in-depth discussion of methodological and philosophical issues through to practical applications. Adopting an international and multi-disciplinary approach, it addresses all key aspects of the talent identification and development process, including skill acquisition and motor learning, psychological factors and family influences, creating optimal environments for performance, and dealing with injury and rehabilitation. 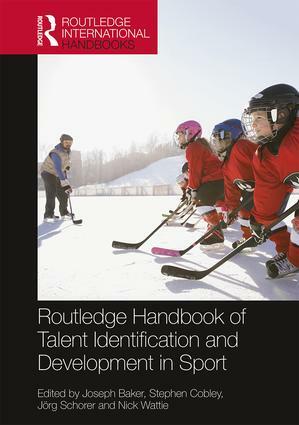 Presenting an unrivalled wealth of research, the Routledge Handbook of Talent Identification and Development in Sport is an essential resource for any undergraduate or postgraduate degree course in sport studies, sport science, sport coaching or sport management, as well as for sport policymakers, analysts and coaches. 2. Does Talent Exist? Yes! 11. Talent Identification and Development in the Context of "Growing Up"
17. Could Sports Biomechanics Provide the Missing Pieces to the Talent Identification and Development Puzzle? Joseph Baker is Professor and Head of the Lifespan Health and Performance Laboratory at York University, Canada. He has also held Visiting Researcher/Professor positions in the UK, Australia and Germany. His research examines the varying factors affecting skill acquisition and maintenance across the lifespan. Joe is Past President of the Canadian Society for Psychomotor Learning and Sport Psychology and the author/editor of eight books, four journal special issues and more than 200 peer-reviewed articles and book chapters. Stephen Cobley is a Senior Lecturer in Motor Control and Skill Acquisition and Sport and Exercise Psychology in the Faculty of Health Sciences at the University of Sydney, Australia. His research interests examine the factors that facilitate or inhibit athlete development from a bio-ecological and multi-disciplinary perspective. His research and applied work has led to the evaluation, modification and writing of athlete development programs and policy for numerous sport organizations. Steve is an Associate Editor for the Journal of Science and Medicine in Sport, and previously co-edited Talent Identification and Development: International perspectives (Routledge, 2012). Jörg Schorer is Professor of Sport and Movement Science at the Carl-von-Ossietzky-University in Oldenburg, Germany. He has worked in academia as well as in the applied talent sector. His research focuses on elite sport across the lifespan. Nick Wattie is an Assistant Professor in the Faculty of Health Sciences at the University of Ontario Institute of Technology, Canada. His research examines various factors related to talent identification and development in sport, with an emphasis on the influence of a range of environmental, individual and task constraints on expertise in sport, skill acquisition and positive youth development, as well as athlete morbidity and mortality.